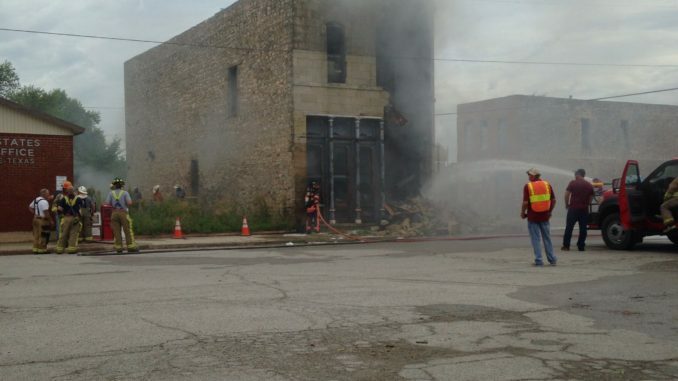 The verdict is in and it appears the 1884 building on the southwest corner of the courthouse square in Montague cannot be saved after it was severely damaged when a pickup truck crashed into it killing the driver on Aug. 19. Building owner Mark Chancellor said this week his engineers and architects, as well as designers met and concluded the building will have to be demolished because it cannot be saved. About 9 a.m. on the morning Aug. 19 a Chevrolet pickup from Oregon crashed through the front double doors of the building. A large portion of the front wall collapsed in on the truck as it caught fire inside the building. The break went all the way to the top of the roof line. It took emergency personnel several hours to stop the fire and then to get a track hoe on site to extricate the truck from the building. The deceased driver was identified as Jason Baraquin, 46, Oregon.